problems and to resolving those problems favorably. The Law Offices of Mark J. 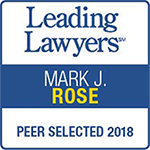 Rose has been lauded by clients as efficient, knowledgeable and responsive and has earned an AV® Preeminent™ Peer Review Rating by Martindale-Hubbell®, the highest recognition in the legal industry for competence and ethics. Mark also has been selected as a 2018 Leading Lawyer in the area of construction law. We represent individuals and companies of all sizes in a variety of business areas, including, but not limited to, construction disputes, bankruptcy, business organization and reorganization, general commercial litigation, mortgage foreclosure, contract preparation and review, trade secrets and confidential information, contracts not to compete, real estate transactions and other aspects of business activity. We litigate disputes involving mechanics lien claims and breach of contract claims and represent owners, developers, contractors, subcontractors and material suppliers in Cook County and the surrounding counties including DuPage, Kane, Lake, McHenry and Will Counties. We have over 40 years of experience litigating issues affecting both public and private construction projects which have included Millennium Park, Northwestern Memorial Hospital, the New Academic Library at Chicago State University, the American Youth Hostel-Chicago, and condominium conversions and developments throughout Chicago. A significant portion of our practice also is devoted to representing individuals and companies in Chapter 7 and Chapter 11 bankruptcy cases. We represent debtors, creditors and creditors’ committees in the United States Bankruptcy Court for the Northern District of Illinois, the Central District of Illinois and in other bankruptcy courts around the country. Call the Law Offices of Mark J. Rose at 312-704-1446 or contact the firm online to schedule your consultation. The Law Offices of Mark J. Rose represents clients in the Federal Courts and in the State Courts of the Chicago Metropolitan area including Cook, DuPage, Kane, Lake, McHenry and Will Counties. Law Offices of Mark J. Rose is located in Chicago, IL and serves clients in and around Cook County.